Bali is a cultural melting pot of south east Asia and the place thrives with culture and AWESOME FOOD. The place is home to thousands of expats and thus promises convenient healthy foods along with offering local delicacies. There’s an endless number of foodie hot spots popping up in the suburbs along the coast of Bali, and the best part is, they all serve mouth-wateringly delicious food to go with the super cute vibe! Where to Eat & Party? Breakfast is said to be the best meal of the day and one should eat like a King. In Mekaseh, you will find an endless list of items provided for breakfast. The options are mind blowing and I love how they have detailed their menu catering to every individual. They have fresh juice counter, salads, egg counter, vegan, veg and non-veg. Similarly they have continental breakfast options, waffles, pancakes along with all varieties of bread and cheese. There is also a separate line of items for people who are on a diet; skim milk choices, cereals, yogurt and skim milk yogurt. Whoof! This is the best breakfast I have ever had in my life. First and foremost this restaurant is a perfect spot for a relaxed lunch, or for simply sitting and watching the world go by. 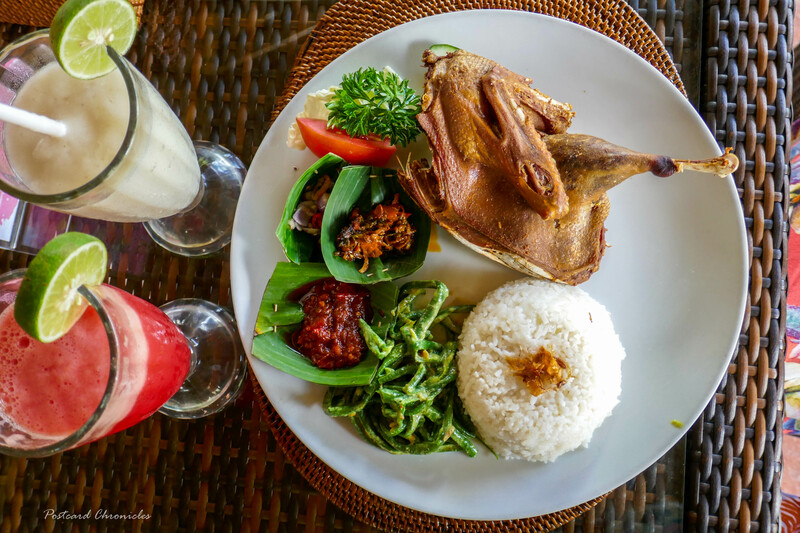 Having a meal at corner of the rice field, while viewing the rice paddies and the wave of the coconut tree leaves, as well as listening to the various tiny little bird singing was an enthralling experience. Bebek Betutu and Tepi Sawah crispy are the highlight of this place. This place and the specially curated menu was the best of the lot. NUSANTARA is my personal favourite in terms of food. Nusantara is an authentic Indonesian restaurant, offering a unique version of our country’s rich culinary heritage. Therefore the menu focuses on authentic, original flavours from across the Indonesian archipelago to present a fresh look at this nation’s regional cuisines. The portions are huge for one person. A must-try place when in Ubud. Nusantara. All these are for one person. Sunday’s at Single Fin are famous all over the world. Imagine sipping on an ice-cold beer, looking at the waves and the surfers, listening to the cheering of happy people on holidays, all with a chilled and relaxed vibe. Due to the popularity of the place, it gets packed most of the times. Tacos with grilled chicken, spring roll, crouqettes cheese are ideal choice for starters. Spaghetti carbonara, prawn friend rice, pepperoni pizza, single fin pizza and roasted vegetable pizza for main course are the must try items from this place. Jimbaran seafood is famous all over the country and Menega Seafood Cafe is one of the favourites among the many cafés that line Muaya Beach in Jimbaran Bay. Even though each of the venues serve practically the same dishes, many regard Menega as having the richest tasting ‘Jimbaran style’ seafood sauces. Good food and attentive staff come with prices that meet in the middle. I was privileged to taste a curated seafood platter with assortment of praws, fish, clamps and crab. While I enjoyed visiting all the cafes that we have been to on our trip to Seminyak, one place that won all our hearts in an instant is NOOK. A gorgeous local eatery overlooking breathtaking views of the paddy fields. What I love about NOOK is that the cafe is tucked away from the bustling Seminyak area, but still within walking distance to the main street. Finally you can escape from the crowd and enjoy some traditional Indonesian delights that do not lose out to those you will find in warungs. La Favela Bali is completely crazy and totally magical, La Favela drew its original concept and vintage design, intimate cosy heavily decorated corners, and Graffiti and stencil art adorned walls from around the globe! We walked-in to this place around 9.30 and found the place to be half empty. The party began only at 12. And don’t even imagine walking through the door around midnight, the queue is till the next street. But one heck of a place to party! Definitely a checklist place if you’re a party animal! To all the foodies out there, i have listed the places i loved. I will keep adding to the list as i keep exploring the food spots in Bali. Next time you know where to eat when in Bali, cause FOOD is LIFE!